BUENOS AIRES, Nov. 30, Chinese President Xi Jinping met with his Russian counterpart, Vladimir Putin, here on Friday on the sidelines of the 13th Group of 20 (G20) summit. 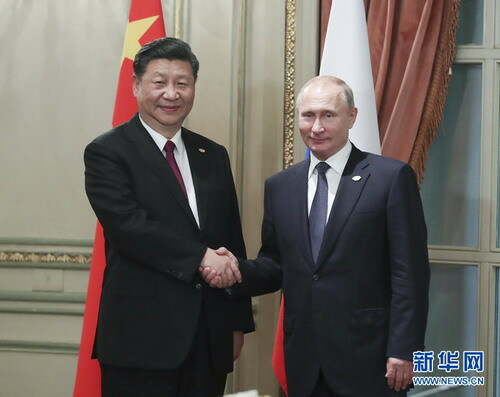 Xi said the development of China-Russia relations enjoys strong internal dynamism and a bright prospect as it goes with the trend of the times and the aspirations of both peoples. Hailing the new achievements in bilateral cooperation in various fields this year, Xi said China and Russia will hold grand and colorful activities to celebrate the 70th anniversary of their diplomatic relations next year and strive for more visible results in bilateral practical cooperation. Xi stressed the important guiding role the two countries' heads of state play in advancing the bilateral relationship, suggesting that the two sides keep the tradition of annual presidential mutual visits. China and Russia, he said, should work together to strengthen the alignment of the Belt and Road Initiative and the Eurasian Economic Union, and deepen cooperation in trade, finance, energy, technology and other sectors as well as at sub-national levels. Xi urged the two countries to step up coordination in multilateral mechanisms including the G20 and BRICS, and unite all parties concerned in upholding multilateralism, safeguarding the core values and basic rules of the World Trade Organization, supporting trade liberalization and facilitation, and opposing protectionism and unilateralism. Putin, for his part, said it is of great significance to maintain close high-level exchanges between the two countries. He spoke highly of the fruitful bilateral cooperation in various fields, citing fast-growing trade, steady progress in such areas as manufacturing, high technology and agriculture, smooth implementation of large-scale projects, and effective coordination on international and regional affairs. Russia is committed to deepening practical cooperation and coordination with China to safeguard global peace and security and build an open world economy, Putin said. The two presidents also exchanged views on some major international and regional affairs in today's world.